Dr Zoom: * Do white people have a future in South Africa? * Do white people have a future in South Africa? Apartheid South Africa looked after white people and nobody else. Now some of its white communities face a level of deprivation, or of violence, which threatens their future in the country. Everyone here, regardless of colour, tells you that white people are still riding high. They run the economy. They have a disproportionate amount of influence in politics and the media. They still have the best houses and most of the best jobs. All of this is true but it is not the only picture. Look below the surface and you will find poverty and a sense of growing vulnerability. The question I have come to South Africa to answer is whether white people genuinely have a future here. The answer, as with so many similar existential questions, is "Yes - but…"
It seems to me that only certain parts of the white community really have a genuine future here: the better-off, more adaptable parts. Working-class white people, most of them Afrikaans-speakers, are going through an intense crisis. But you will not read about it in the newspapers or see it reported on television because their plight seems to be something arising out of South Africa's bad old past - a past which everyone, black and white, would like to forget. According to one leading political activist, Mandla Nyaqela, this is the after-effect of the huge degree of selfishness and brutality which was shown towards the black population under apartheid. "It is having its effect on whites today, even though they still own a share of South Africa's wealth which is entirely disproportionate," he said. That may all be true. But the people who are suffering now are the weakest and most vulnerable members of the white community. Ernst Roets, a leading Afrikaans campaigner from the AfriForum organisation, took me to a squatter camp outside the country's capital, Pretoria. A white squatter camp. It has been set up on the property of a sympathetic white farmer and is called, optimistically, Sonskyn Hoekie - Sunshine Corner. There are broken-down cars and bits of discarded furniture everywhere. Beyond the wooden shacks lie ditches and pools of dirty, stagnant water where mosquitoes breed. Two basic toilets serve the whole camp. 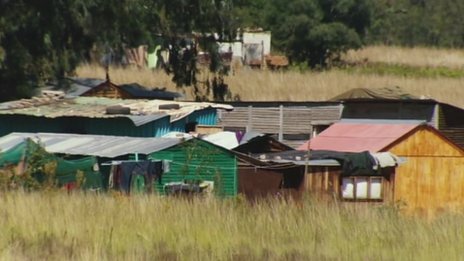 According to Roets there are 80 white squatter camps - many of them bigger than this - in the Pretoria area alone. Across South Africa as a whole he believes there could be as many as 400,000 poor whites in conditions like these. Sonskyn Hoekie has no water and no electricity. The inhabitants live on two hand-out meals of maize porridge a day, which is provided by local volunteers. There is no social security for them, no lifeline - any more than there was for non-whites when apartheid ruled. "I don't want to live in a place like this," said Frans de Jaeger, a former bricklayer, who with his beard and wrinkled face looks like one of the old Voortrekkers. "But I can't get out." His wife died suddenly of cancer a few years ago and it sent him into a downward spiral of binge drinking and destitution. Semi-skilled white people have little chance of getting a job when so many black South Africans are unemployed. There is another group of white Afrikaners, far higher up the social scale, who are deeply threatened - in this case, literally. Virtually every week the press here report the murders of white farmers, though you will not hear much about it in the media outside South Africa. In South Africa you are twice as likely to be murdered if you are a white farmer than if you are a police officer - and the police here have a particularly dangerous life. The killings of farmers are often particularly brutal. Ernst Roets's organisation has published the names of more than 2,000 people who have died over the last two decades. The government has so far been unwilling to make solving and preventing these murders a priority. I went to a little town called Geluik - happiness. A few weeks ago gunmen burst into the farm shop there and opened fire, killing one farmer outright and injuring one of his sons and a shopworker. They stole next to nothing. It seemed to be a deliberate, targeted killing. Soon afterwards the son died of his injuries. Belinda van Nord, the daughter and sister of the men who died, told me how dangerous the lives of white people in the countryside have become. The police, she said, had seemed to show little interest in this case. In the little graveyard where her father and brother are buried there are two other graves of farmers murdered recently. The wonderful landscape which surrounds it has become a killing ground. In the old days, the apartheid system looked after whites and did very little for anyone else. Nowadays white people here are on their own. Those who fit in and succeed will certainly have a future. As for the rest, there are no guarantees whatsoever.